Please scroll to the bottom for the latest addition to “Stan’s World” Parts 1,2,3 & 4! Since Stanley arrived into our home we have always felt he was an easy dog to have. Stanley was our second born pup, he has been a big part of the family since the very moment he was born in the living room. Taking on board his cosy surroundings and his genetics – the love of sofas grew. His mother has always enjoyed the luxury of sofa surfing and this does seem to be a genetic trait of the dogs at Marchstone! Stanley seeks pleasure in laying on the sofa, rolling about making all sorts of happy groaning noises as he gets comfortable, with a sigh he will settle, legs up in the air. Stan strikes this very relaxed pose for the rest of the evening. Stanley enjoys his comforts, often he will sneak up on to the bed at night time once he thinks he can get away with it. Perfecting the leap and slide technique he settles by my feet in one easy move. As Stanley hasn’t had to have the upheaval of getting used to a new home we have always found him to be a very settled pup and no bother at all. 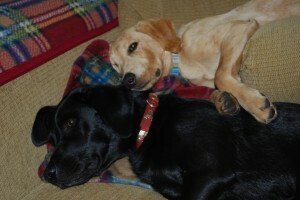 Stanley loves to have a hoolie with his friends, in particular Roxy is one of his best pals. He plays hard to get bless him. Roxy is a Border Collie Cross and does not give up easily, herding him all over the park. Which of course is all part of the fun. Along his many doggy pals he also has a special friend – Lucy the cat. They share kisses every day. Stans other special friend is Katherine. She and Stan are prefect companions, he will trot happily with her, to heel. A strong bond shared between the two of them. We have always walked him with the other dogs off lead with no difficulties, until that is of course when he hit the age of 6 months when this dog suddenly found his legs and would race off on a walk. We worked hard on his recall to the point he would turn on a sixpence once called. The pleasure in walking the dogs was soon regained. So we settle back into our familiar ways of walking the dogs not worrying about what any of the dogs were getting up to – feeling rather pleased with ourselves at how splendid our dogs are. Giving ourselves a pat on the back for being such superb dog owners. It is known that pups do have a momentary blip in their standards of behaviour at the age of roughly 6 months, I have also been told by fellow dog owners that they all calm down at the age of two years. I rather feel Stanley is going to be the exception to the rule as it would seem this pup is refusing to grow up and currently is testing the boundaries. 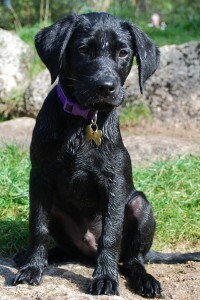 Having just had a very positive training session with the four labs, I had been recalling them in a variety of orders with the success of calling Stanley last out of the four. I was really pleased with the progress I have been making with the 1 in 4 recall. Stanley then bounds off like a gazelle having found a broken dog toy. With a whoop he joyously launches the toy in the air and catches it. The next thing I know is that he has raced off to the duck pond, completely oblivious to my calls. I then make Molly, Archie and Charlie sit stay, whilst I retrieve this wayward pup who has been minesweeping for bread scraps. Credit to Molly, Archie and Charlie as they did stay until I returned a few minutes later – given the distance I had left them, I felt very pleased with them. Stanley however was firmly in my bad books. I made him walk to heel trying to enforce the idea it is not worth his hassle in running away. Until the next time I’m sure. For now Im trying to work out why is Stanley suddenly becoming a reprobate when he had been so good (apart from his blip at 6mths). I believe Stanley is intent on being a puppy for as long as he can get away with it, he has suddenly started stealing shoes and chewing them. Running gleefully around the house should you desire to have your shoe back. He has decided Dave needed to have a new pair of flip flops, not that Dave knows – yet! Bless him, he was a very easy boy and I am sure normality will once again resume, however I think until then I will be having to keep several paces ahead of his very mischievous ways. Katherine has just celebrated her birthday. Stanley has managed to partake in the birthday activities, it was clear to him he was entitled to some birthday cake. Shame he didn’t wait until he was given his supposed share, the little monkey helped himself to the remainder of the birthday cake. Half a cake! Agh! The worry initially was due to the fact we thought he had eaten two of the special candles which had plastic spikes on to hold them in place. Thankfully the two candles were found the next day after I had a sleepless night fretting over the possibilities. Yet another birthday cake that bites the dust, only last time it was his Mother that ate nearly an entire cake that had been crafted in to a Fairy Castle. A masterpiece that I never got to taste! It has to be said this dog is following in the footsteps of his mother in more ways than one! This is Stans World – I wonder what he will get up to next? Stan is re-living his puppy hood. Desperately clinging on to the fact he isnt two years old yet when supposedly dogs grow up. This juvenile is now creating havoc. Nothing is safe. He has managed to eat a £10 note and more recently chewed a visitors shoe. (the shame). Now when I say he is re-living his puppy hood. He never really behaved like a naughty puppy but it would seem he is rebelling against the new additions to the household. He is stubbornly refusing to give up his position of being the youngest in the pack…. for a couple more weeks only will he remain the youngest of our dogs whilst on a walk. 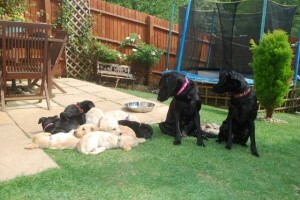 Melvin is still very much with his litter brothers and sisters so Stanley as yet doesnt know which puppy is staying. When Stanley learns that not all the pups are going to new homes I think he may well be a little bit miffed. I can see Stanley is already sorting out his toys so he can run away to Aunty Lynda’s up Norf. Stanley will soon be accepting his half brother into the pack and creating merry havoc with each other Im sure. The pair will be getting up to mischief together….what have we done eh?! Fun and frollicks, zest for life will be the recipe of our days. Training will be a must and a certainty in ensuring harmony will continue. Stanley is coming to terms with the idea that their might well be a puppy staying here. He is paving the way into making sure he will be in charge of the playtime. So far he is making the puppy submit he gives it a very good sniff whilst he is wagging his tail. Stanley is still pushing the boundaries which has included a few mischievious habits occurring. He steals toys and runs off with it in complete glee. If that dog could roar with laughter he would, the twinkle in his eye and poking his tongue do capture his mood rather well. I think we have to keep it in mind that Stanley may well teach Melvin a few tricks. Shoes now have to be kept away at all times, he will at any opportunity chew a shoe. (chewing yet another visitors shoe – the shame) I have decided anyone entering Marchstone Manor is doing so at their risk! I have had a little more time in the last few days to spend training with Stanley. 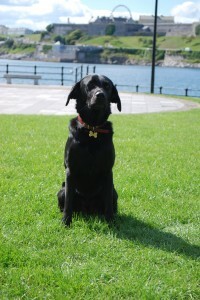 We have taken the dogs up to the fort at Mountbatten, doing some impressive recall and sit/stay work with him. (Molly left, Stanley right) "Come on Mum which one is staying?" Stanley has now come to terms with the fact the yellow fluffball is here to stay. We are getting less strops from him, fewer shoes chewed (though he seems to think it is funny to run around with them now…the little monkey). Stanley has embraced Melvin with all four big paws!, playing takes place frequently throughout the day, with nap times also spent cuddled up to his brother. Playtimes are comical to watch as Melvin attempts to take on the stance of a stag in effort to be as big as “Big Bro”. I think finally we have a dog that is happy with his position in the pack as Big Bro. Stanley having a mad charge about with Melvin! Full on madness and chaos with these two but it is all in good fun! In Stan’s World….Has Stanley finally grown up, now that he has responsbility of being a big brother? Somehow I doubt it! Bless him! "He aint heavy he's my brother"